We have used Leith Domestics for all of our appliance failures over the past couple of years and found them to be extremely efficient in both attendance and administration. Willie is a very courteous contractor to deal with who offers a prompt, reliable service in every aspect of the job. We would not use anyone else! We service and repair all makes and models of domestic appliances. We offer competitive rates, often offer a next day service or in emergency cases (subject to availability) same day appointments. 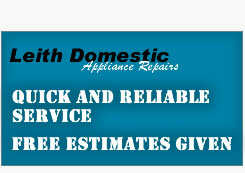 We have built our reputation and experience over the last 11 years as Domestic Appliance Repairers & Installers. Parts and labour guaranteed for 6 months - (depending on repair type). Three simple ways of booking an engineer visit or delivery time slot. Book an appointment date by calling 07846657603 or use our online booking form or alternately email williamwallace@leithdomestics.co.uk and we will contact you to arrange a convenient appointment. For any product or service enquiries not covered here, or if there is anything you wish to ask us please fill in the contact us form and we will endeavour to answer your queries as soon as possible. Registered office - Mitchell House, 5 Mitchell Street, Edinburgh, EH6 7BD.